The next two days are two days that completely changed my life forever. Today, four years ago, I quit my corporate job. 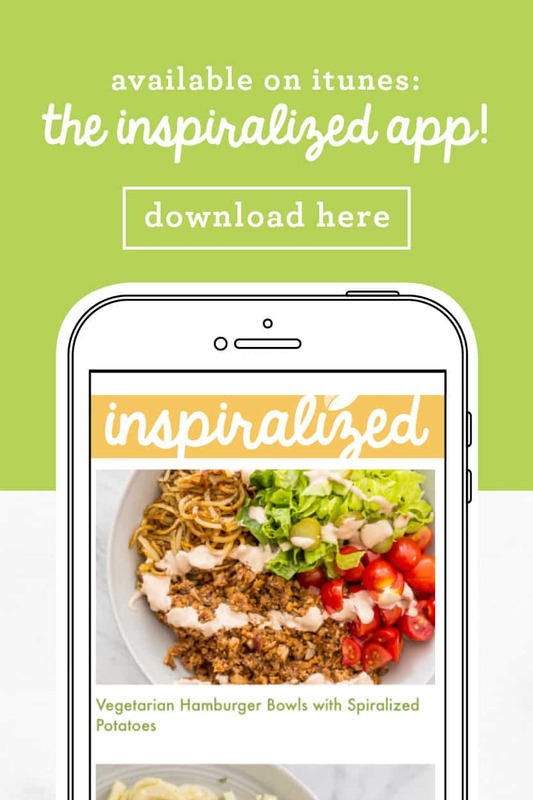 I walked into my boss’s office, I quit, and I walked home, bought the domain “Inspiralized.com” and felt a level excitement for the future that I could never adequately put into words. I felt like I had this huge opportunity in front of me and I knew I was going to take it. I could barely sleep that night, I really felt like a kid on Christmas Eve. The next morning, I walked with Lu to work and on the way, I stopped at a local Starbucks and said “Wish me luck!” I went inside that Starbucks and started building Inspiralized. I started with building my social media handles, registering for a WordPress page, and creating an editorial calendar. I had absolutely no idea what I was going to do. I never thought about the financial part of things, I just knew that it had to work out. And if it didn’t, well, I’d cross that bridge when I got there. I’m not that big of a planner, can you tell? Quitting my job and starting Inspiralized was the best thing I ever did (aside from marrying Lu, of course!) 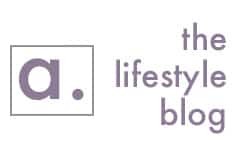 and I am so excited to celebrate my four-year blogiversary tomorrow- get ready for a fun giveaway! 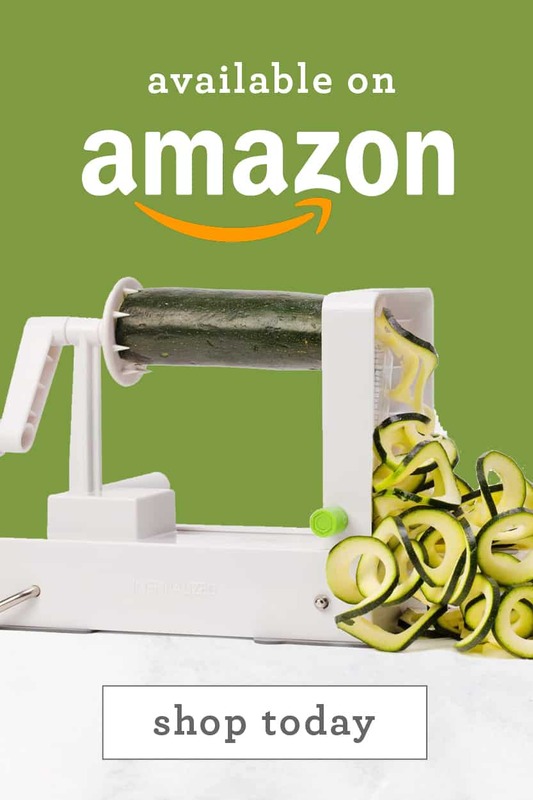 Now, you may be wondering why today’s recipe isn’t spiralized. Well, considering I have published only spiralized recipes for the past four years, I figured today was a great day to post my first NOT-SPIRALIZED recipe. Gasp. 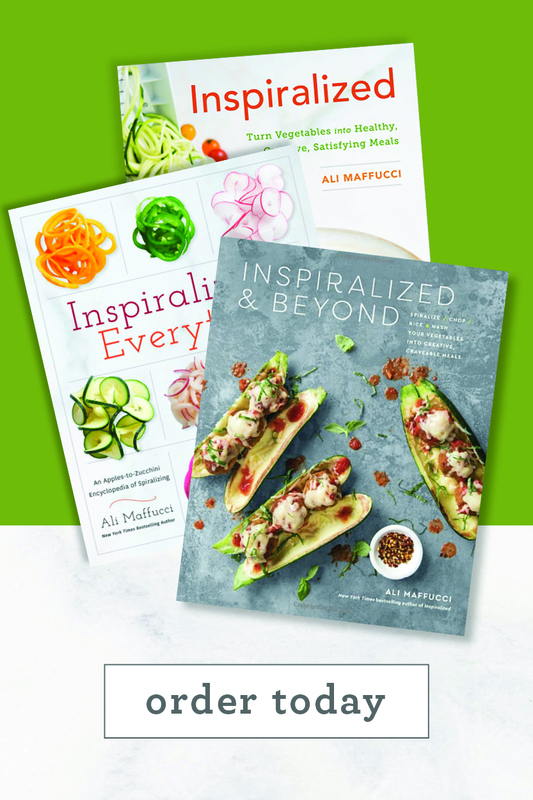 As you may know from my announcement on Instagram a few weeks ago, I’m in the process of writing my third cookbook (make sure you check out cookbook one and cookbook two) and the theme is “Inspiralized and Beyond.” In this book, I’ll be including spiralized recipes of course, but I’ll be going beyond the veggie noodle and sharing recipes that use vegetables in other creative, satisfying ways! 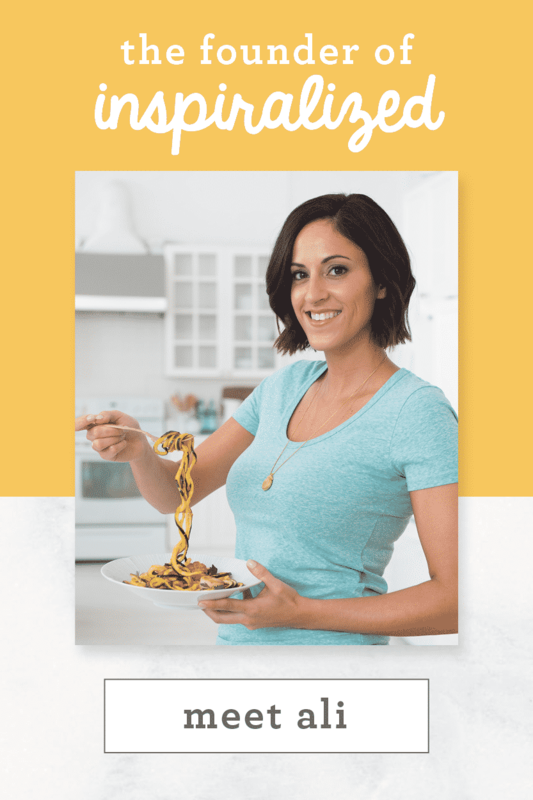 I’m most excited for this cookbook because it accurately reflects how I eat – a mix of spiralized recipes and non-spiralized recipes. For example, cauliflower rice is a creative way to transform vegetables. 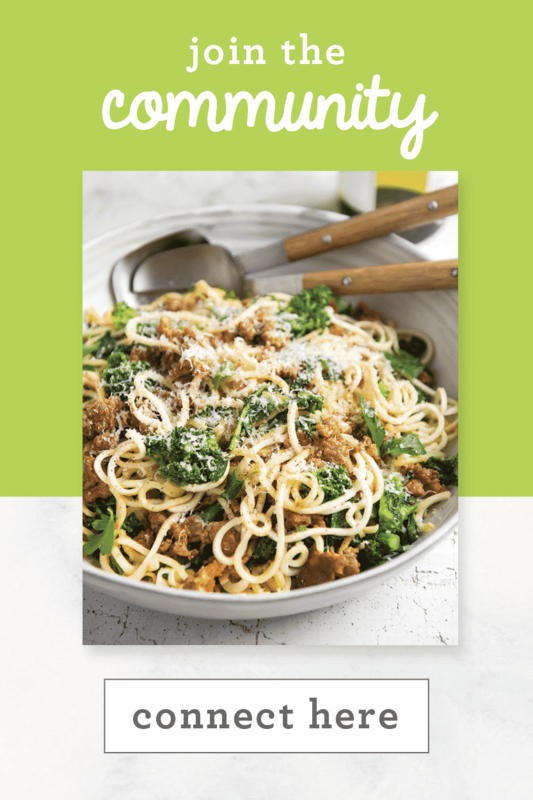 I’m going to posting one non-spiralized recipe monthly (the last Sunday of every month) and I’m proud to partner with Green Giant for my very first #BeyondInspiralized series post! 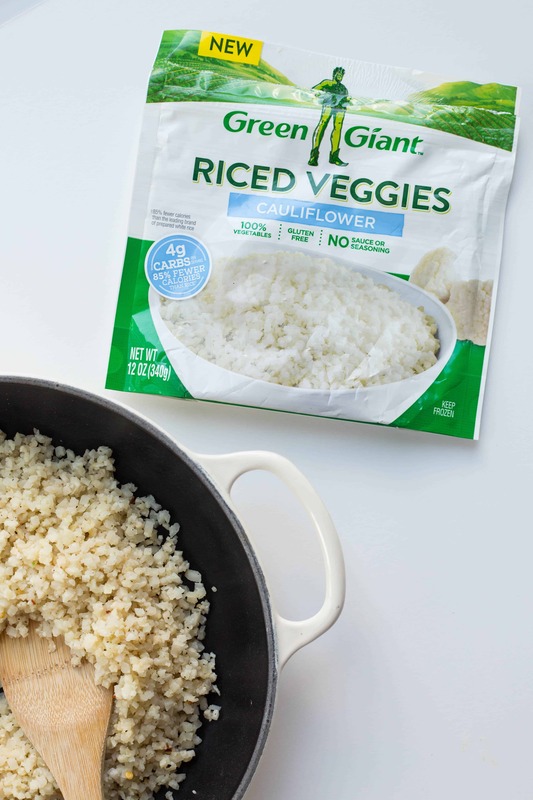 Fairly recently, Green Giant launched a line of frozen riced veggie products, featuring three varieties:Riced Cauliflower Medley, Riced Cauliflower and Sweet Potato, Riced Cauliflower and Broccoli, and plain Riced Cauliflower, which I used in today’s recipe. Now, personally, I HATE ricing cauliflower. While it’s worth the pain, it’s just so messy! I’m finding little cauliflower bits for days in my kitchen. It’s also pretty time consuming. When I found out Green Giant launched a frozen riced cauliflower, I had to try it! Their Riced Cauliflower has larger cauliflower bits than you can create yourself at home with a food processor and thus, they’re more rice-like. I love the consistency and now my freezer is stocked with Green Giant’s riced veggies! 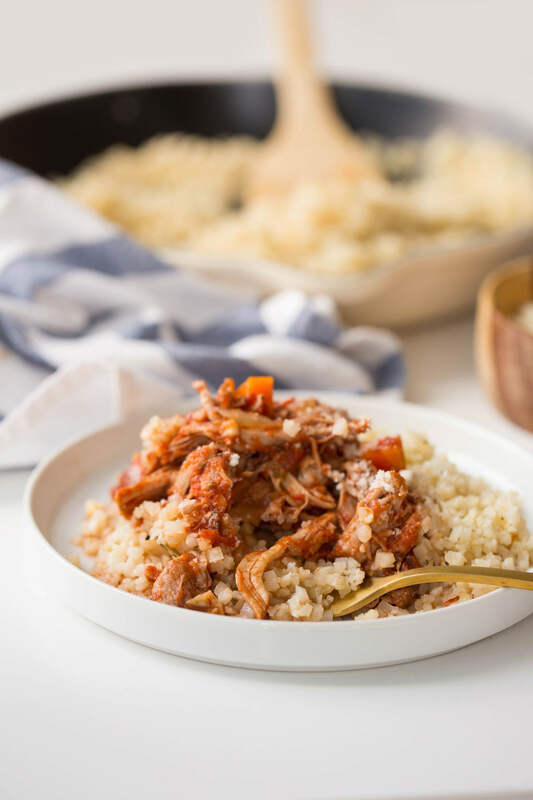 These Green Giant Riced Cauliflower bags are ideal for meal prep, so I decided to make a slow cooker Italian-style pork ragu to serve over the rice (because what’s more meal prep-friendly than your slow cooker?) 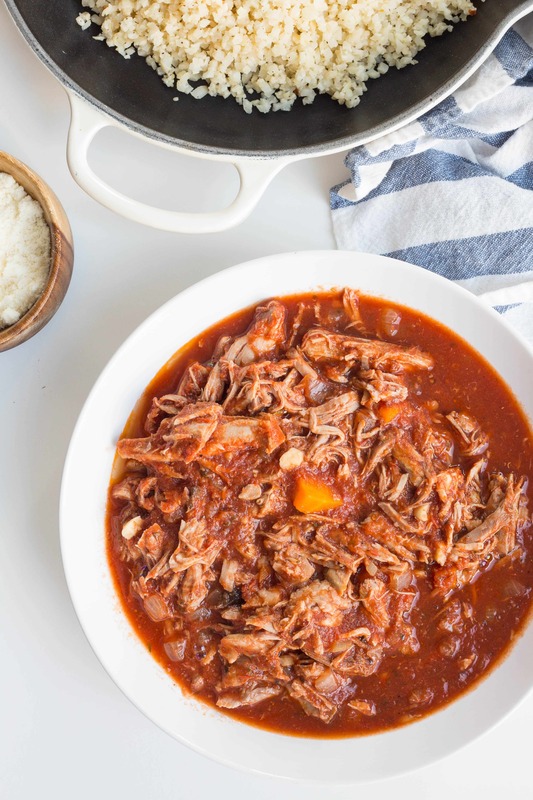 The pork is slow cooked with fresh herbs and tomatoes for a velvety smooth ragu that’s aromatic. The cauliflower rice soaks up the sauce and softens underneath the pork. Lu did a dance after he ate this, if that’s any indication of how tasty it is! To find these Green Giant products near you, try their “Where to Buy” locator. And I’ll see you tomorrow on the blog to celebrate my 4-year blogiversary! Note: This post was sponsored by Green Giant. However, all opinions are my own, always. 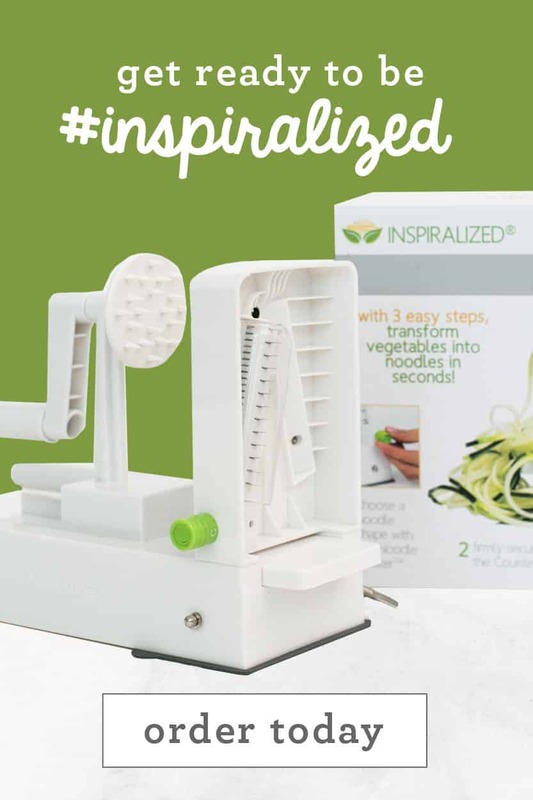 Thank you to Green Giant for supporting Inspiralized! In a 4 to 6 quart slow cooker, combine the carrot, onion, garlic, thyme, oregano, bay leaf, tomatoes, 1 teaspoon salt, ½ teaspoon pepper. Stir and add the pork and turn to coat. Cover and cook until pork is tender enough to shred easily with a fork, on low for 7 to 8 hours or high for 5 to 6 hours. Once pork is done, remove the pork pieces with tongs and shred with two forks. Place the shredded meat back in with the remaining sauce and stir. Cover and keep warm. Heat 1 tablespoon of the oil in a large deep skillet over medium-high heat. Once oil is shimmering, add in half of the garlic and half of the red pepper flakes and stir until fragrant, about 30 seconds. Add in two bags of the cauliflower rice and stir well. Season generously with salt and pepper and let cook until rice is heated through. Set aside and repeat with remaining bags of cauliflower rice until they are all cooked. 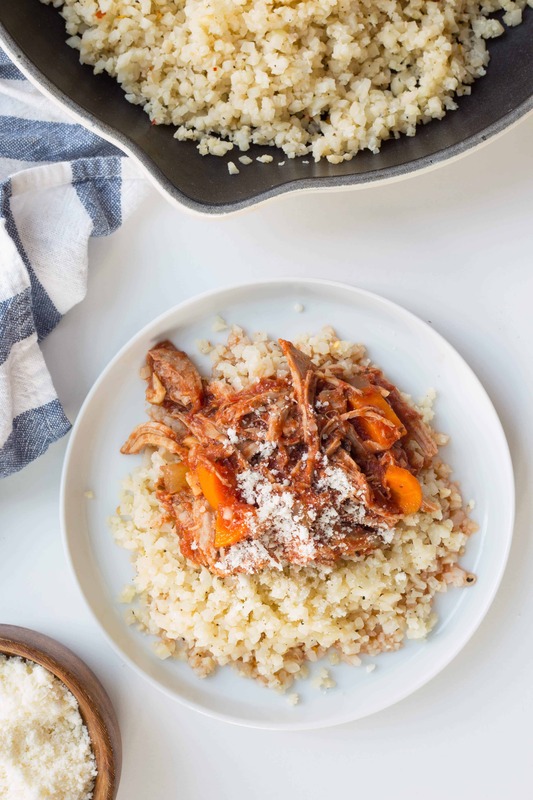 Serve the cauliflower rice with the pork ragu and a side of Parmesan cheese. Can't wait to try this! How many servings does this recipe make? Happy you're going to try it! 10 servings! Can't wait to try this one. 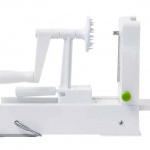 My spiralizer( not the REAL one) was in storage waiting for my house in Florida to be built. So missed a of the healthy recipes I could have made! Happy to have it back, even though it's not the REAL one.. Thank you, Ali for a of your hard work! I hope you try it!! And thanks for the kind note. I'm with you... ricing cauliflower is THE WORST. The cleanup is my worst nightmare! I'm so thankful my local Kroger store has bags of riced cauliflower for only a few dollars! This recipe looks divine! Thanks for sharing! The recipe looks off. Is it 4-5 bags of the rice or 2 bags? The ingredients don't match up to the recipe - same with the garlic and red pepper flakes. Am I missing something? I have to do batches of caulfilower rice and freeze them into individual sized portions. This usually happens when I see cauliflower on sale. Pinned this one!! recipe looks lovely however the instructions are off for the quantities required? I am absolutely so proud of you and I don't even personally know you. 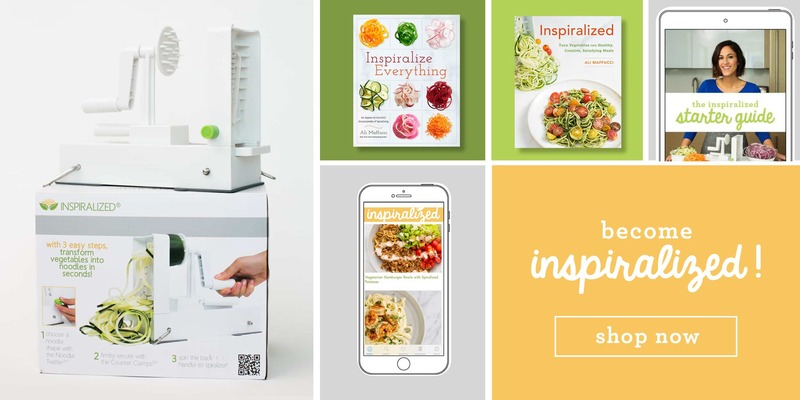 I have been following your progress with Inspiralized from the beginning. I've been blogging for about 5 years and have had the pleasure of following along your successes. I remember when you only had about 500 followers and I once told my wife, "she's going to make it big!" eHealed.com wouldn't be where it is today if it weren't for the inspiration that I get daily from you and Inspiralized. Thank you for being you, Ali! This was so perfect for a weeknight meal - I'm a working FTM and it's so hard finding full, hands off meals that are quick to get on the table at night. Would love some recommendations of similar recipes - I only get about an hour with our LO before he's ready for bed and I hate to spend any of that time cooking, but also hate to eat late because I'm still cooking after he goes down (and I go to bed early as well!) Thanks for all the great recipes and inspiration!